Isla Petroleum & Gas Corporation (IP&G) have purchased 25x SBES LifeSaver ATEX/Ex Transmitters for their tanker fleet based in the Philippines. A Swiss manufacturer of flavours, fragrances, and active cosmetic ingredients chooses the SBES LifeSaver ATEX/Ex certified lone worker alarm system to protect their staff within their manufacturing site located in SINGAPORE. According to Wikipedia this Swiss manufacture is the world’s largest company within the flavour and fragrance industries. European Aeronautic Defence and Space Company have chosen the SBES LifeSaver lone worker alarm system to protect their staff at their premises located in Stevenage (UK). This aviation giant has also chosen the SBES LifeSaver ATEX/Ex lone worker alarm systems for use within their spray booths at their manufacturing site located in Chester (UK). This well-known international company based in Mumbai that offers fabric care, hair care, baby care products, shampoos, soaps, and other personal products has chosen the SBES LifeSaver lone worker alarm system to protect their staff at their largest production factory in ASIA (Hyderabad). Lone workers can enjoy ATEX-compliant protection. 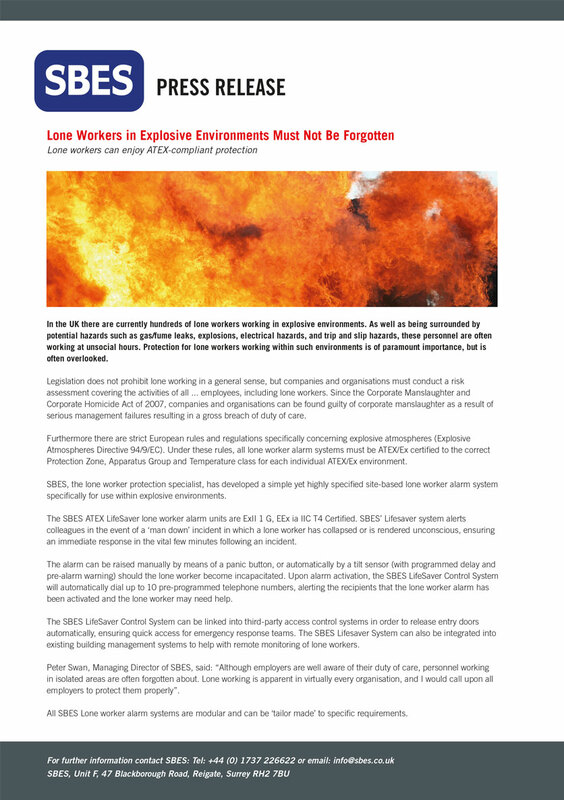 In the UK there are currently hundreds of lone workers working in explosive environments. As well as being surrounded by potential hazards such as gas/fume leaks, explosions, electrical hazards, and trip and slip hazards, these personnel are often working at unsocial hours. Protection for lone workers working within such environments is of paramount importance, but is often overlooked. For the full story - see pdf below. 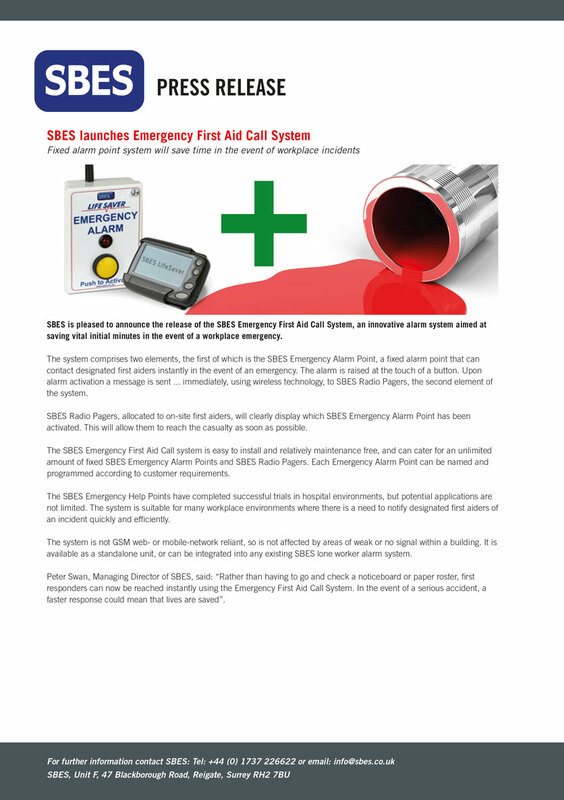 Fixed alarm point system will save time in the event of workplace incidents SBES is pleased to announce the release of the SBES Emergency First Aid Call System, an innovative alarm system aimed at saving vital initial minutes in the event of a workplace emergency. For the full story - see pdf below. 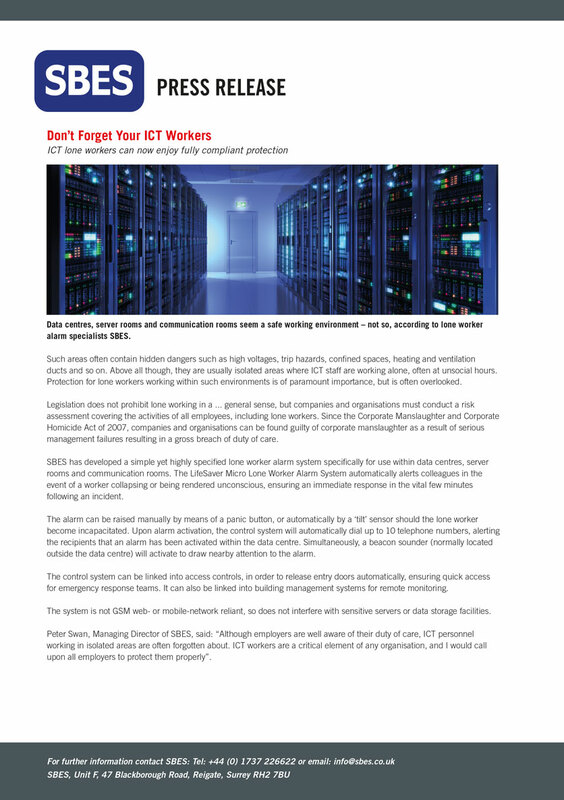 Data centres, server rooms and communication rooms seem a safe working environment – not so, according to lone worker alarm specialists SBES. For the full story - see pdf below.